So I guess we're ready to sit back and enjoy a leisurely five-issue mini-series with no problems to solve. Oh, wait. 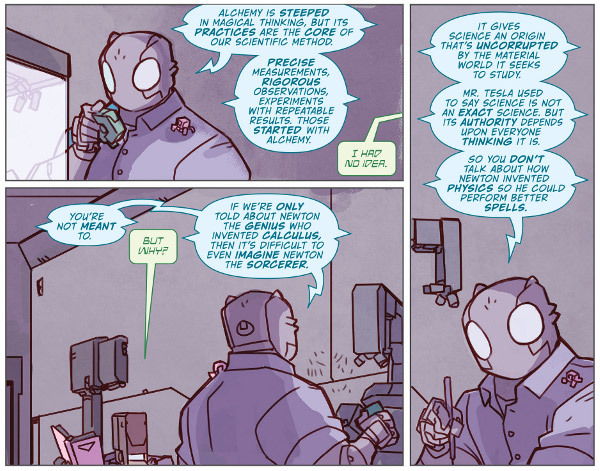 This is an Atomic Robo comic! Okay, bring on the zany science craziness! The first issue gives us a feel for the new recruits and foreshadows potential issues on Bernard's adventure. However, it's Robo's conversations with Alan that prove the most interesting. In instructing his "son" the history of robotics and humanity the lesson turns philosophical and Robo finds himself in the unenviable position of a father asked a question he wasn't prepared for and doesn't know how to answer. Worth a look.